When your air conditioner or HVAC system is on the fritz, the temperature in your home can rise quickly. In just a few hours, the temperature can become uncomfortable for pets, children and elderly adults, not to mention your perishable food items may spoil more quickly. Help prevent the risk of becoming overheated in your home by calling LIBERTYAIR. We are available from 7 a.m. to 11 p.m., Monday through Saturday, so you can count on our quick response to the rising temperature in your home. Plus, there’s never an overtime charge with LIBERTYAIR. Our professional technicians are skilled in investigating malfunctioning air conditioners to identify the underly cause. Then our technicians can promptly repair your air conditioner. Broken A/C? Don’t sweat it — call LIBERTYAIR! A lot can go wrong with an air conditioner or HVAC (heating, ventilation and air conditioning) system. 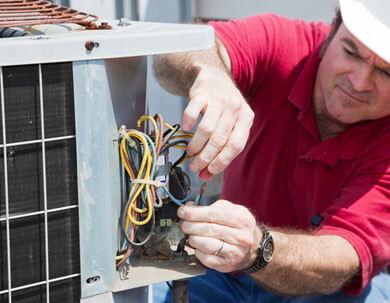 When your air conditioner has stopped working properly, you need a professional service that can accurately diagnose the issue and repair your system without a lot of fuss or expenses. At LIBERTYAIR, our technicians are adept at fixing all the name brand air conditioning units, and many of the off-brand air conditioners as well. No matter the brand, or where you bought it, we will always try our best to repair your air conditioner to working order before suggesting a replacement. In Florida, in-home air conditioning is not a luxury but a necessity. Due to the long and extremely hot summers, having a working air conditioner can be necessary for the health and safety of your family. And because of the high level of humidity in Gainesville, homes can become a hotbed for the growth of mold and mildew, not to mention other allergens that can be distributed throughout the ducts in your home. For the best in residential air conditioning repair Gainesville FL services, rely on LIBERTYAIR. We believe that honest, quality work is the key to success, which is why our technicians are always courteous and respectful. It’s also why we provide the fastest, yet highest quality, of work in North Central Florida. Before you call LIBERTYAIR, there is a list of diagnostics that you may want to check. This is not required as our emergency repair line is available to help you. However, we know that a lot of homeowners, renters and property owners in Gainesville are do-it-yourselfers. If you’re able, here is a list of things to check when your air conditioner isn’t working. Thermostat. Check your thermostat to ensure that it is working. Make sure the thermostat is on, that it is set to the “cool” position, and that the desired temperature is lower than the current room temperature. If your thermostat is battery-operated, check the charge on the batteries or replace the batteries. A quick check to ensure that both digital and non-digital thermostats are working is to lower the desired temperature and listen for when the fan turns on. Circuit breaker. Check the circuit breaker to see if the breaker has tripped. If it has, try resetting it. If the breaker trips immediately, it’s time to call in the professionals. Air Filter. It might be hard to believe, but a clogged air filter can wreak havoc on an air conditioning and heating system. If the air filter appears dirty, it’s time to replace it. Vents. Double check that the vents from the air ducts are open and free from debris or obstructions. If your air conditioner is still not cooling your home after checking the thermostat, circuit breaker, air filter and vents, then contact LIBERTYAIR. We can quickly assess the situation and determine if the issue lies with your air conditioner, thermostat, blower or compressor. Stay cool all year long with our excellent air conditioning repairs. Keep Your Air Conditioner Healthy! At LIBERTYAIR, we recommend that every air conditioner receives planned maintenance throughout the year. Basic maintenance on an air conditioner can not only extend the life of the system, but improve the quality of air in your home. Ask us how to keep your air conditioner running smoothly all summer long in addition to improving your home’s Indoor Air Quality (IAQ). You’ll breathe a little easier with clean air ducts and a well-maintained A/C.